It has long been a tenet of American society that income disparity is more acceptable provided that there is a reasonable chance that someone who starts poor can make their way up the economic ladder to at least middle class status through education and work. This is the premise of the American dream and of a society based on the principle of meritocracy. In this post we use DC taxpayer data to analyze income mobility, the extent to which an individual’s income changes over time. This data allows us to determine the probability of an individual moving up the rungs of the economic ladder. The analysis also determines how far up one is likely to move up the economic ladder, starting at the bottom. We focus initially on singles since income mobility is easier to define for a single individual than for married couples, where income is defined on an aggregate basis. For a married couple, upward mobility could be the result of various outcomes- both spouses moving up the ladder simultaneously, one spouse moving up the ladder and the other remaining steady, or some other combination. We examined mobility for singles by looking at where individuals stood on the economic ladder in 2002 and compared this to where they ended up in 2012. The percentage of filers who changed positions on the ladder measures the probability of moving on the ladder. Reading across starting from the top row, 39 percent of individuals who were in the bottom 20 percent of the income distribution in 2002 remained in the bottom twenty percent in 2012, 28 percent moved up one rung of the ladder to the second quintile (20th to 40th percentile), 15 percent to the third quintile and so on for the other quintiles. Similarly for the second row, 18 percent of individuals who were in the second quintile in 2002 fell down the ladder ending up in the lowest quintile in 2012, 35 percent remained in the same quintile and so on. Shaded boxes in yellow denote no change in income status, blue shading denotes upward mobility and red denotes downwards mobility. Thirty nine percent of singles who started poor (in the lowest quintile) remained poor after a decade. The median age for filers stuck at the bottom was 49 years. Given that these individuals are well into their career paths, the chances of their income prospects improving in the next ten years are likely to be small. Twenty eight percent who started at the bottom moved up one rung of the ladder, and 33 percent from the lowest quintile made it to middle class status or higher (40th percentile and higher). For those starting in the second quintile in 2002, the chance of moving up to middle class status one decade later was 47 percent. The likelihood of remaining in the middle class in 2012 for those already in the middle class in 2002 was greater than 25 percent. What can we conclude from the data? In a society where income mobility mitigates some of the worst effects of an unequal distribution of income, an individual through increased work experience and skill acquisition, would likely experience at least one movement up the ladder over a ten year period, or stay steady if she or he is at the top rung (See further discussion below). While the data indicates that this is the case for most filers who started in the top three quintiles, for those on the lowest rungs of the ladder (the lowest two quintiles) the chances of moving up are only about 50/50. Various factors have been cited to explain the scarce mobility of individuals at the bottom of the income distribution. In a previous post we explored whether career paths contributed to this lack of mobility and found that increasingly the occupation one is employed in influences this outcome. An employee in retail or education will have a hard time moving up the ladder. Other studies have focused on other factors such as increasing cost of college education, the decline in unionization rates and free trade to explain this lack of mobility. Data is from the 2002 and 2012 DC income tax returns for single Individuals excluding senior filers. 22,742 single filers were in the data for both years. Income quintiles represent the following income ranges. Is a ten year time frame sufficient to consider income mobility? A simple framework to analyze this is to consider how a person’s income would progress over a typical career path of approximately 40 years (say from ages 25-65) in a world where there was mobility across a wide range of career opportunities and access to education. This individual would begin her/his career at age 25 at or near the low-end of the income scale. Through increased work experience she/he would move up a rung on the ladder and by their mid-thirties be at or near middle class, and after another decade, in their 40’s, expect to move up to achieve upper middle class status. In this career path each rung of the income ladder can be thought of as about 8 years (40 years /5 quintiles), so that after a decade an individual should move up at least 1.25 rungs. Other considerations- Because the data is limited to DC filers, the analysis provides a more limited view of income mobility for the nation as a whole, as individuals can move to other states to seek better economic opportunities. While this is a limitation of the analysis, it is important to note that during the 2002-2012 timeframe the DC economy was one of the strongest performing in the nation. The probability that an individual could move up the ladder by moving to a different state was not likely to be high during this timeframe. The June Trends report from the Office of Revenue Analysis reports that the annual growth in non-lawyer professional services and business services topped private sector job growth in the District in May. How does the District compare to the rest of the nation? From May 2014 to May 2015, professional and business services jobs grew in 44 out of 52 jurisdictions (50 states, the District, and Puerto Rico); here is a look at how the District compares to the other states in this sector. The District added 4,900 new jobs in the professional and business services sector between May 2014 and May 2015 (seasonally adjusted). This number is smaller than what we see in other states (the District ranked 22nd) but that is because we have a much smaller workforce compared to many other states. The top four states with the largest gross increase in professional and business service jobs are – California, Florida, Texas, and New York. The picture changes slightly when you look at the growth rate in professional and business services jobs in that jurisdiction. 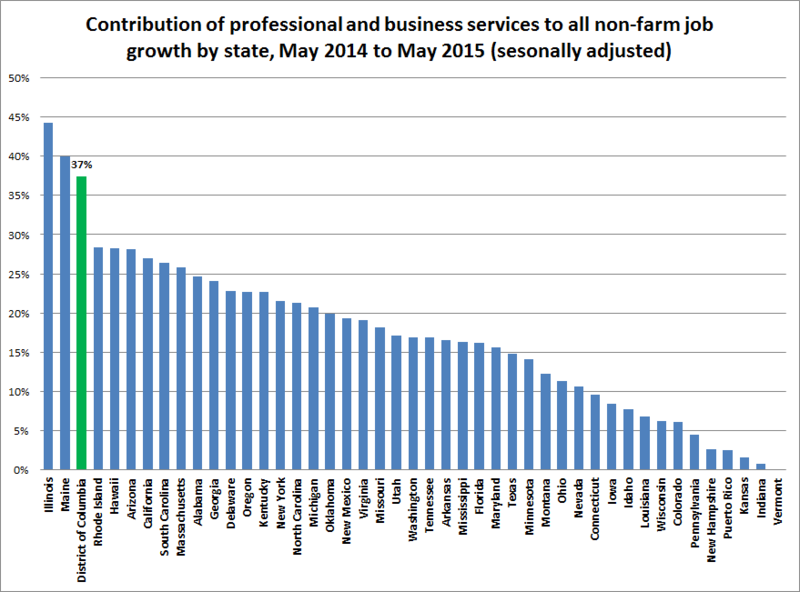 Professional and business services jobs grew faster in the District compared to other states: 12 percent between May 2014 and May 2015 (seasonally adjusted) while the average state growth was 2.1 percent (seasonally adjusted). Here, the District ranks 18th among all states–higher than Texas and New York. Oregon tops the list, just above California, with a 5.5 percent growth in the professional and business services jobs. However, the District really stands out when one looks at how much this sector contributed to overall growth. 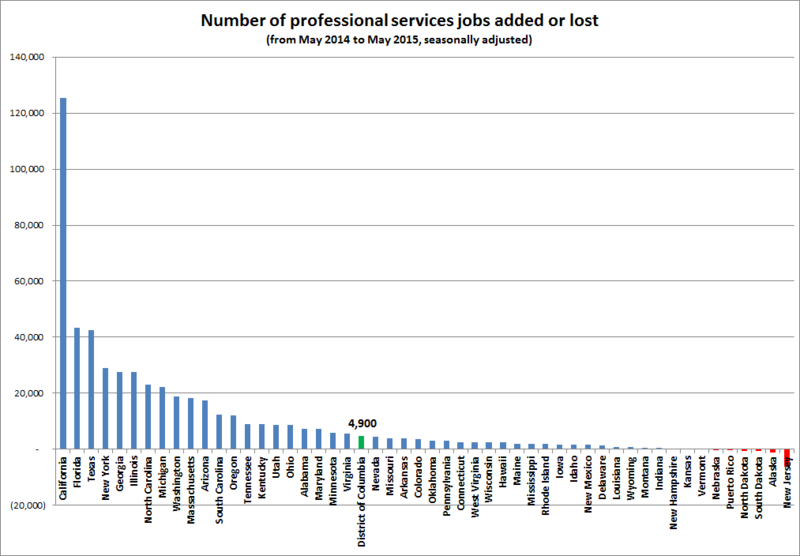 The District is heavily dependent on professional services jobs for overall growth in the last year. When we look at all the jobs we added in the last year (13,100 total jobs added between May 2014 and May 2015, seasonally adjusted) professional services accounts for 37 percent of the new non-farm jobs. 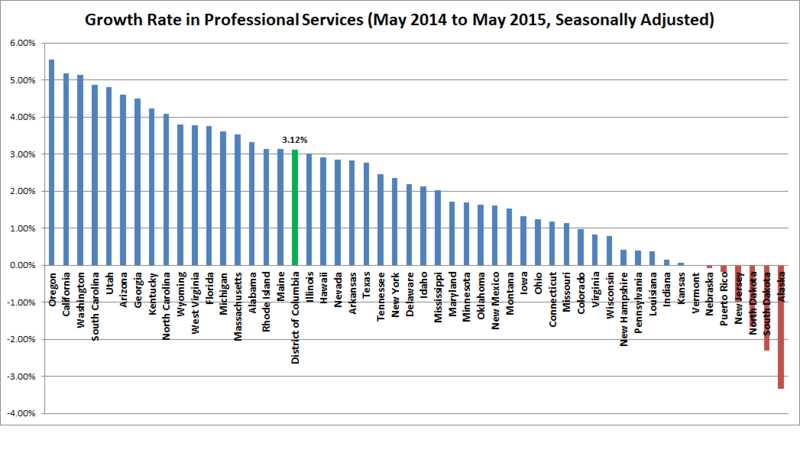 Here, the District ranks 3rd among states in percent of growth coming from professional services. Bureau of Labor Statistics State and Metro Employment data. Specifically, Regional and State Release Table 5, Employees on non-farm payrolls by state and selected industry sector, seasonally adjusted. (http://www.bls.gov/sae/#tables). The District government’s expenditures from its local resources increase every year (well, almost every year). In constant-dollar per-capita terms, however, expenditures have dropped since 2008. 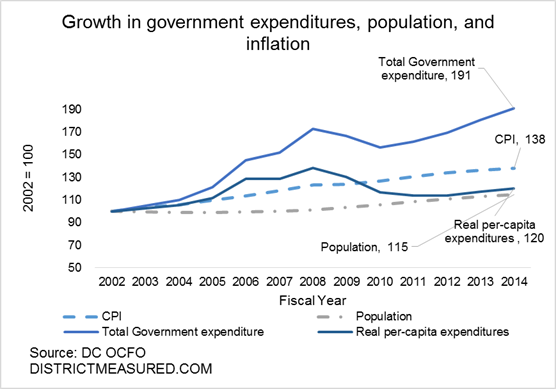 In other words, government spending since 2008 has not kept pace with the combination of inflation and the District’s population increase. Total expenditures increased steadily from 2002 through 2008, peaking at nearly $6.3 billion, but fell in 2009 and 2010, during the great recession. 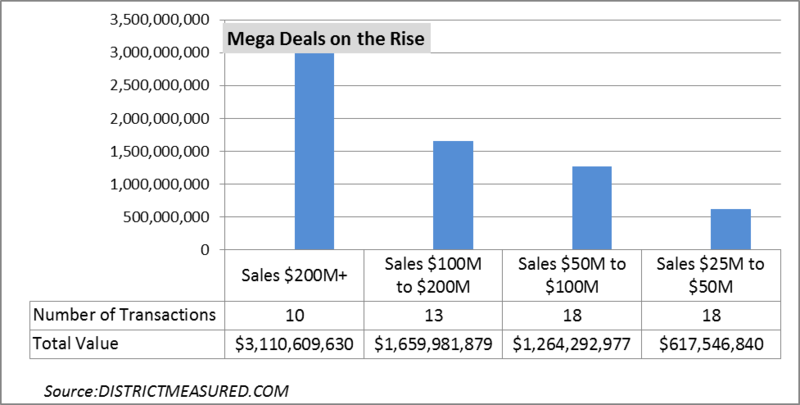 By 2013, they had exceeded their earlier 2008 peak and reached nearly $7 billion in 2014 – almost double the 2002 level. However, two cost drivers (inflation and population, shown in dashed lines in the graph below) have also been increasing. Population today is 15 percent greater than where it was in 2002, and the price level is 38 percent higher. As a result, per capital spending, adjusted for inflation, has remained stagnant. Between 2008—the peak year—and 2012, per capita government spending, adjusted for inflation (in 2014 dollars), declined from $12,104 to $9,963, and since then it only marginally increased to $10,509. Human Support Services – including the Departments of Human Services (and the local share of funds for Temporary Assistance for Needy Families (TANF)), Health, and Health Care Finance (including the local share of Medicaid funds). Public Education System – including D.C. Public Schools, Public Charter Schools, the local subsidy to the University of the District of Columbia, and D.C. Public Library. Public Safety – including the Metropolitan Police Department, the Fire and Emergency Medical Services Department, and the Department of Corrections. 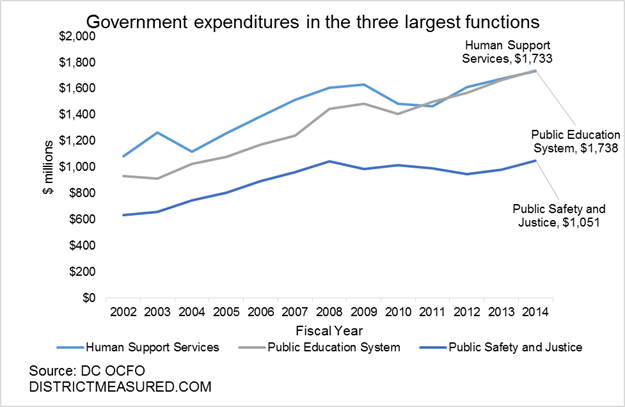 Expenditures in Human Support Services, and to a lesser extent in Public Education, fell in 2010 as the District’s revenues fell during the Great Recession. However, the District was able to partially make up for these losses using federal stimulus funds (through the American Recovery and Reinvestment Act of 2009). During this period, the federal government paid for a larger share of our Medicaid bills, and we also received additional education funds. The federal stimulus funds are not in this chart, which shows only the District’s expenditures from its own funds, but they made up for some of the decline in local spending and allowed the District to keep its services closer to a constant level. Because we were able to use the federal funds, the District was able to shift its own dollars away from these areas – to be replaced by the federal funds – and toward other areas of need. For example, expenditures in Public Safety remained fairly steady in the face of the decline in revenue over the 2009-10 period. Governmental Direction and Support – including the Office of the Mayor, the District Council, and agencies that serve other government agencies such as the Department of General Services, the D.C. Department of Human Resources, and the Office of the Chief Financial Officer. Economic Development and Regulation – including the Department of Housing and Community Development, the Department of Employment Services, and the Deputy Mayor for Planning and Economic Development. Public Works – including the Department of Transportation, the Department of Public Works, and the District’s subsidy payment to the Washington Metropolitan Area Transit Authority. Financing and Other – including all debt service agencies, the operating budget contribution to capital projects through Pay-as-you-go (Paygo) capital, and the District’s contribution to its retirees’ health care costs. Expenditures on these functions fluctuated more over the 2002-2014 period than did those in the three largest functions. 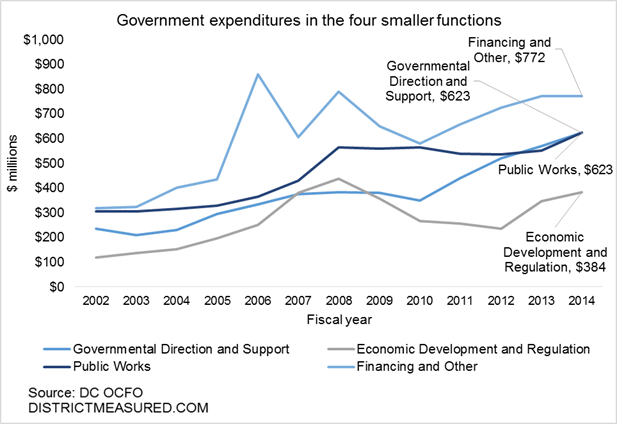 In particular, expenditures decreased by more than 45 percent between 2008 and 2012 in Economic Development and Regulation, and by more than 25 percent between 2008 and 2010 in Financing and Other. This might indicate that spending on economic development projects and capital projects (through debt service and Paygo capital) expand when revenues are strong and are easier to reduce when revenues decline. What exactly is this data set? The expenditure data include all District government agency spending from the General Fund. The General Fund, broadly speaking, means revenues and other resources the District raises locally, through taxes, fines and fees, and sometimes use of its own fund balance (accumulated surpluses from prior years). Spending of federal or private grants is not included in these expenditure data. The data include slight adjustments from the data reported in the District’s Comprehensive Annual Financial Report to maintain comparability across years. This study is for the operating budget only, as opposed to the capital budget. The operating budget covers day-to-day needs and purchases that are generally consumed within the current year. For example, most government worker salaries, school operations, most public safety expenses, and transfer payments to residents (such as Medicaid) are paid for through the operating budget. The capital budget covers purchases of assets with a long life, usually 5 years or more. For example, construction of schools or other government facilities, improvements to road and bridge infrastructure, and purchases of police cars and fire trucks are paid for through the capital budget. A future post will discuss the District’s recent capital expenditures. 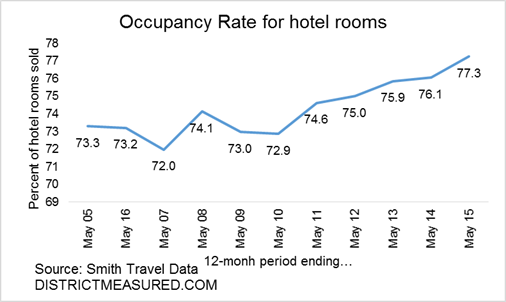 According to STR, Inc., an industry data company, the demand for DC hotel rooms for the 12-months ending May 2015 was 6.2 percent higher than in the prior 12-month period. The high demand, combined with an average room rate that was 4.3 percent above the prior year’s, drove hotel revenue higher by a remarkable 10.7 percent. 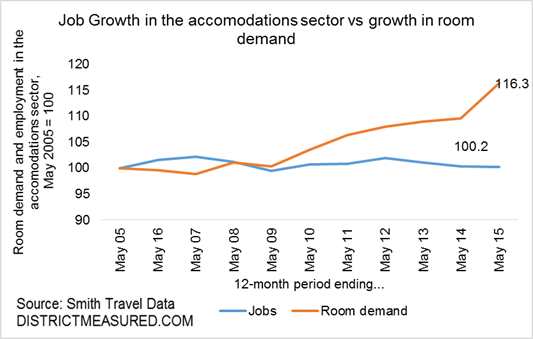 Looking back over the past decade (from May 2005 to May 2015), the year that just ended was by far the best one for growth in room demand and revenue as measured by the 12-month moving total. The past year, the first full year in which the new Convention Center hotel began operating, also saw the highest occupancy rate of the decade (77.3 percent) for all hotels in DC. The 4.3 percent increase in average room rate in the past year was also the highest percent change in 4 years. Over the past 4 years, however, rates have remained stagnant and most of the gain in revenue has been attributable to increasing demand. The strong hotel room sales is adding roughly $22 million to the District’s tax revenue in 2015. The District taxes hotel accommodations at 14.5 percent and uses about a third of its collections to pay the debt service on the Convention Center bonds and support tourism promotion. In 2014, the hotel tax generated $226 million in revenue—this is about one fifth of total sales tax revenue in the District. A 10 percent growth in the hotel sales would also boost the tax collections by the same proportion. However, the stronger demand and prices have not yet translated into more jobs in the hotel sector in the District. 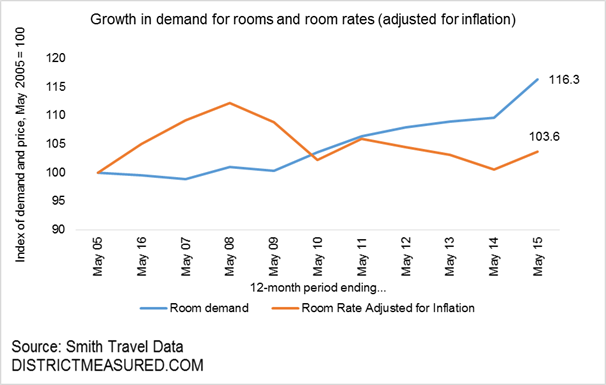 Room demand increased by more than 16 percent in the last decade and revenue, adjusted for inflation, is up by more than 20 percent. At the same time, there has been virtually no gain in wage and salary employment reported by the Bureau of Labor Statistics for the DC accommodations industry sector. The accommodations industry includes more than the hotels included in the STR, Inc. statistics, but the lack of increase in reported employment likely also reflects some combination of change in the mix of hotel types, productivity increases, and changes in proportion of full-time and part-time employment in the hotels. You can read more about the performance of the hotel industry in the June 2015 District of Columbia Economic and Revenue Trends report. What exactly what is this data? STR, Inc. is a private company that reports industry data on hotel demand (room-days sold in a month), hotel supply (number of hotel rooms available for rent each day of the month), average daily rate, and revenue. Employment numbers are from DC accommodations sector as reported monthly by the US Bureau of Labor Statistics. Are you related to someone named Michael or Mary? So are many of District residents. Michael and Mary happen to be two of the most popular names for men and women in the District of Columbia. In fact over 3,000 Michaels and 1,700 Marys submitted income tax filings in 2014, over 6,000 Michaels and 3,600 Marys are registered to vote, and over 29,000 Michaels and 23,000 Marys have been born in D.C. since 1910. After reading an article about first names in the Washington Post and after speculating about what our two colleagues would name their now one-month-old babies, we decided to take a closer look at the frequency and characteristics of first names in D.C.
Social Security Records (first names of individuals born in D.C. with a Social Security card since 1910). We then filtered and ranked the data and limited our analysis to top 500 most popular names. Check out the interactive table below to see if your name made the top 500. In addition to ranking names by popularity, we used Social Security data to plot the frequency of names in every birth year since 1910. As you scroll through each year you can see how a name’s popularity changes over time for all births in the District. A note of caution – data in early years is likely not as accurate as the most recent. Nonetheless, it is interesting to see how naming fads come and go with time. The interactive graph below visualizes how specific names change in popularity over time. For example, we again chose Michael and Mary. If you are related to a Michael born in the District, there is a good chance that he was born before the 1990s; and if you are related to a Mary born in the District, she was likely born before the 1970s. Both names were wildly popular over the past century but both have declined in frequency – Michael peaked in 1958 and Mary in 1946. To analyze the relationship political party affiliation has with first names, we calculated the frequency of first names among active registered voters and their political parties. The interactive map below shows party affiliation by name and zip code. The sortable list below can be used to compare the top 500 most frequent names among registered voters and the political parties they most frequently register with. 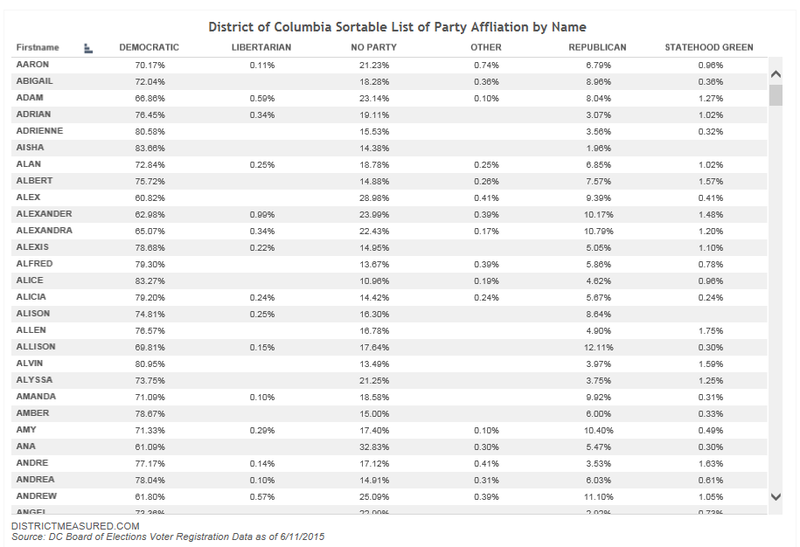 Here are the most and least common names by political party affiliation. We also created a tool to analyze political party affiliation by name and Ward. Enjoy playing around with the interactive tables and graphs and let us know if you have any interesting observations.